BSl series is with new feature of ergonomic desgined new cab. Operation, maintenance and machine design is greatly enhanced. New features keep you running longer, increase your uptime. Select a radius lift path for top forward reach, or a vertical lift path for the best loading efficiency SSL series. 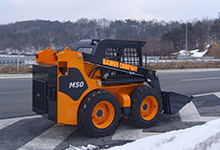 SSL series are the most common model with a radius lift path and they are a great all-around skid steer loader, from paving to loading and more. SSL series are designed for long & stable operation in the toughest applications and they combine the best performance advantages into one machine, mid-range working heights such as dumping over walls, backfilling or unloading flatbed trucks. NOW ENJOY YOUR WORKS with SSL series! V series is the beginning of the vertical lift path line up. This entry level machine is very maneuverable in tight areas, has ample auxiliary hydraulic flow to run the majority of attachments, and has excellent reach at the top of its lift cycle for loading trucks or pallet fork applications. Great all around visibility, plus easy maneuverability in tight areas and fast cycle times add to your productivity. 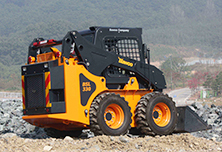 V series loader provides plenty of power, lift and reach. V series are ideal for placing pallets especially those loaded with heavy materials such as brick, block or sod. J series will give you the power and control to get the job done right. J series features redesigned cab with a standard suspension seat and improved serviceability. Joystick controls allow you to control all machine functions with your hands. Fingertip controls make all operation comfortable and accurate. The detent feature continuously engages hydraulic flow without needing to hold the switch. Joystick model gives you more than enough power and convenience to perform high productivity loading duties without any fatigue. 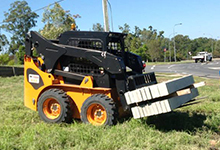 For particular purpose of skid steer loader at tight space. A compact but highly effective by a narrow width, high dump height and powerful performance. M series feature a compact size for many inside tasks that requiring maximum handling power and maneuverability in a confined space. 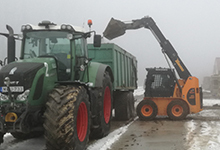 Different jobs demand different requirements in a loader. The diversified line up of Bawoo loaders is ready to meet those different challenges. 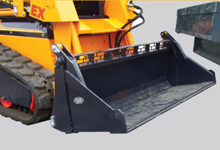 Various attachments fill needs in agriculture, construction, landscaping, industrial, mining and waste applications. 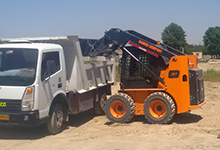 All Bawoo loaders are with universal quick coupler system for easy installation of various attachments. Having the right tools is key to any job. 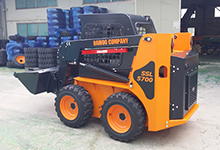 Bawoo skid steer loaders with various attachments can be competent for shoveling, lifting, excavating, drilling, cleaning work.